« Do Tax Cuts “Starve the Beast”? I shared a remarkable chart last year exposing Obama’s terrible record on job creation. It showed that the economy enjoyed big employment increases during the Reagan and Clinton years, but it also revealed anemic data for the Obama years. That’s not a surprise since Reagan was the most pro-freedom President since World War II and Clinton almost surely comes in second place. Yes, Clinton did raise tax rates in his first year, but he put together a very strong record in subsequent years. He was particularly good about restraining the burden of government spending and overall economic freedom expanded during his reign. He was no Reagan, to be sure, and the anti-government Congress that took power after the 1994 elections may deserve much of the credit for the good news during the Clinton years. Regardless, we had good economic performance during that period – unlike what we’ve seen during the Obama years. Which makes this Michael Ramirez cartoon both amusing (in a tragic way) and economically accurate. 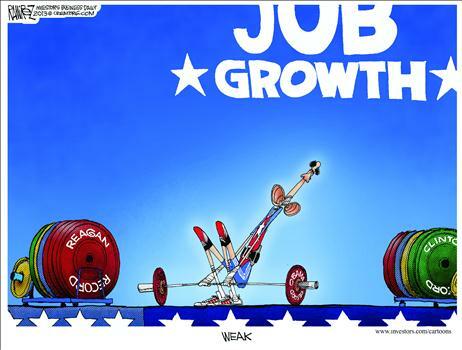 Since we’ve had relatively weak numbers for both jobs and growth this entire century, it would have been even better if the cartoon showed Bush and Obama both trying to raise the bar. The real lesson is that big government is bad for jobs and growth, regardless of whether politicians have an “R” or “D” after their names. P.S. Interestingly, now that the election is over, even the Washington Post is willing to publish charts confirming that Obama’s economic track record is miserable. Yeah, but Obama is much better at hanging curtains to obscure Exit signs.